Traumatic brain injury (TBI) has been designated as the signature injury of the recent conflicts in Afghanistan and Iraq, and as a result many injured soldiers and their families suffer in silence. In response to the need, the US military is now funding new research and has established multiple centers for those soldiers with traumatic brain injuries to receive effective therapies to rebuild and reroute their neurological pathways in the hope returning to work and building a better future. Though most of the traumatic brain injury cases we handle are the result of vehicle and work accidents, hazardous military duty and sports activities also often lead to traumatic brain injuries (TBI). 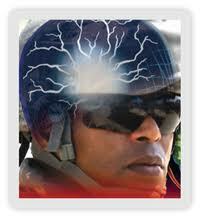 Injury to the brain is usually the first injury to occur, and the last to be diagnosed. Thanks to new funding by the US military and the NFL, more hope, treatments, and tests are available to help heal the wounds. Symptoms of TBI involve a wide range of symptoms including vomiting, persistent headaches, sensitivity to light, memory loss, mood disorders, inability to focus, slow reaction time, dizziness, depression, blurred vision, and loss of balance. On the leading edge of TBI research are studies concerning the use of Omega-3 fatty acids and new cognitive therapies designed to reroute and stimulate neurological pathways where healthy parts of the brain can compensate by learning to handle new functions. Rest augmented by a battery of mental exercises involving memory drills, math, and hand-eye coordination can help a brain accomplish neuroplasticity, a term which means that the brain repairs, regenerates, and reconnects. In January of 2013, the results of the examination of the brain of the former NFL player, Junior Seau, were published indicating that Seau’s brain was found to be clearly damaged by the repeated blows inherent to football. Prior to his death by suicide, he had been diagnosed with degenerative brain disease. Results of an NIH study of Seau’s brain revealed abnormalities consistent with chronic traumatic encephalopathy (CTE), a severe problem experienced by dozens of top football players. The NFL may be facing thousands of lawsuits right now from former players who say that they were not protected or informed enough about the result of concussion. In response, The NFL, both directly and in partnership with the NIH, Centers for Disease Control and other leading organizations, is supporting a wide range of independent medical and scientific research that will both address CTE and promote the long-term health and safety of athletes at all levels. More and more, researchers have speculated a connection between sports-related concussions and mild traumatic brain injuries with the development of degenerative brain diseases later in life – most notably chronic traumatic encephalopathy (CTE) and even Alzheimer’s disease. Previously, the only way to confirm a connection between repetitive brain injury and these debilitating brain conditions was through an autopsy. But now, there may be a new way to identify or track the progression of these brain diseases while a current or former athlete is still alive. For the first time, researchers from the University of California Los Angeles (UCLA) have utilized positron emission tomography (PET) scans and a newly developed chemical marker called FDDNP to do brain imaging tests on five retired NFL players. The new imaging technique ultimately revealed the buildup of the abnormal tau protein, which has been associated with repetitive head trauma, as well as the onset of Alzheimer’s. Brain Health Education and Research Institute was founded by Dr. Michael Lewis in 2011 to pursue educational and research endeavors to further knowledge of natural and nutritional ways to improve brain health. The initial focus of the Institute is educating providers and the public on the use of omega-3 fatty acids for the prevention, treatment, and rehabilitation of the brain prior to or following injury such as traumatic brain injury or concussion. With Dr. Lewis’ 30-plus years of military experience, a special emphasis is working towards improving the care and outcomes of our military personnel and veterans who have experienced psychological or physical trauma to the brain. According to Dr. Lewis, there is no cure for concussion and TBI. All medical providers can do is optimize the conditions to help the brain do the healing. That is what using omega-3’s will do. It provides a tool, the basic building block, for the brain’s healing. Neurosurgeon Dr. Julian Bailes is often at the cutting edge of the latest treatments for people with brain injuries. Former NFL players and other notable people with brain injuries—including Randal McCloy Jr., the sole surviving miner in the 2006 Sago Mine disaster in West Virginia—have received his care. Dr. Oz talks with Dr. Bailes about how he used omega-3 fatty acids, a common nutritional supplement, to aid in Randal’s brain recovery. Soon though, Dr. Bailes says he and the other doctors were confident they could save Randal’s life, but it was uncertain if his brain would recover from its extensive injuries. Randal was given three hypobaric oxygen treatments, but Dr. Bailes says there was no drug available that could help repair his damaged brain. “Since there was no drug to do it … why don’t we give him what his brain was made from in the first place, when he was an embryo in his mother’s womb?” Dr. Bailes says. That substance was omega-3 fatty acids. “Omega-3 fatty acids—EPA and DHA—[are] what people commonly would call fish oil, but we gave him a super variety in extremely high doses, up to 19 grams a day that we delivered to him in a liquid form through his tube that was in his stomach,” he says. As Randal’s brain functions started to improve, Dr. Bailes recorded his findings and now says people suffering from minor to severe brain injuries can benefit greatly from omega-3s. “Consider this as a nutritional supplement, if you will, for their recovery, which I think has very profound effects on the brain,” he says. While Randal was the first known person with brain injuries to be treated with omega-3s, Dr. Bailes says he won’t likely be the last. And, Dr. Bailes says everyone can benefit from the supplement—in fact, he says he takes 800 milligrams of algae-based DHA a day. Randal McCloy has gone on to live a normal life in a small town in West Virginia, and has become the father of two children since the Sago coal mine disaster. Research published last year by Brain Health Education and Research Institute’s Michael Lewis, MD, in the Journal of Clinical Psychiatry reported that active duty military with lower blood levels of omega-3 fatty acids were 62% more likely to have committed suicide compared to those with higher levels. In October, 2012, the military announced they are funding a three-year study to do just that. In cooperation with the NIH, researchers at the Medical University of South Carolina led by Bernadette Marriott, PhD, a professor in the Clinical Neuroscience Division of the Institute of Psychiatry, will test whether omega-3 fatty acids found in fish oils can relieve the anxieties and quiet the suicidal thoughts plaguing many combat veterans. If research by the Army and Cleveland Clinic is successful, then diagnosis for brain injury could include an inexpensive blood test. Medical researchers are developing a test that will determine the presence of a protein that is released into the bloodstream after a person suffers a brain injury. Researchers are currently testing their findings by analyzing the blood of college football, hockey, and soccer players to even diagnose concussions. Current methods of diagnosing brain injury involve the use of a CT scanner. These scans are expensive and may also fail to detect slight bleeding and other signs of a brain injury. The military has also ordered nearly 50,000 sensor helmets with the ability to measure severity of blows to the head and to detect for possible concussions. The NFL is partnering with the military to place similar sensors in the helmets of professional football players. Research indicates that the potential for serious lifelong traumatic brain injury is increased greatly if a subsequent head injury occurs a short time after a concussion, so a quick and inexpensive means of determining mild brain injuries could be a lifesaver for military personnel, workers, children, and sports participants. As a lawyer who has helped victims of TBI navigate and receive substantial settlements from insurance companies, my great hope for these injury victims is that they would be able move forward with their lives and receive the best care and treatment available. Kudos to those who are at the forefront of this helpful new research designed to overcome TBI and help those people function in a manner close to that of their pre-injury selves. Submitted by the Robinette Legal Group, PLLC, West Virginia Injury Lawyers. Free books for WV accident victims — Call us today: 304-216-6695 or 304-594-1800 for your free copy of Righting the Wrong: WV Serious Injury Guide; Collision Care: WV Auto Injury Guide; or Beside Still Waters: WV Fatal Injury Guide for Families. We are glad to answer your questions. A distressing complication that may arise following a traumatic brain injury—pseudobulbar affect (PBA). Due to minimal awareness and knowledge of PBA in the medical community, PBA is often misdiagnosed as depression or part of the primary neurological disease when in fact it’s a separate, treatable condition. Your link is fascinating. Thanks for adding it. don’t speak about these issues. To the next! All the best!! CT scans are only good for acute diagnosis. MRI is much better tool for looking at an injured brain. Having said that, it often takes 6 months to a year for a brain to fully realize all the degenerative effects from a serious traumatic brain injury.